Eastern senior Sharp Facemyer (10) launches a three-pointer over Southern junior Coltin Parker (22), during the Eagles’ 11-point win on Friday in Racine, Ohio. 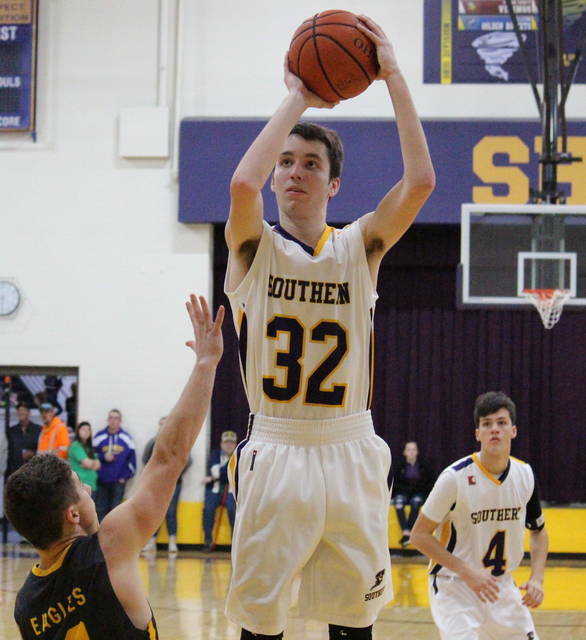 Southern junior Trey McNickle (14) shoots a two-pointer over Eastern senior Blaise Facemyer (12), during the Eagles’ 70-59 victory on Friday in Racine, Ohio. RACINE, Ohio — A strong finish means a great beginning to league play for the Eagles. 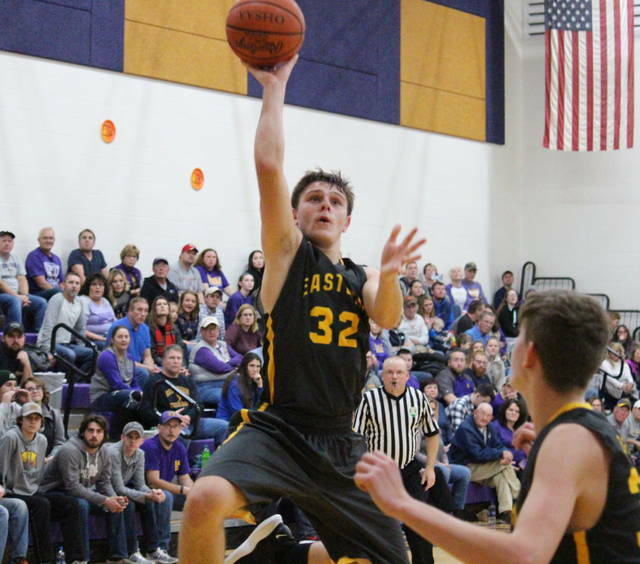 The Eastern boys basketball team closed Friday’s Tri-Valley Conference Hocking Division showdown at Southern with a 15-8 run, securing the Eagles’ 70-59 victory in the league-opener for both teams. 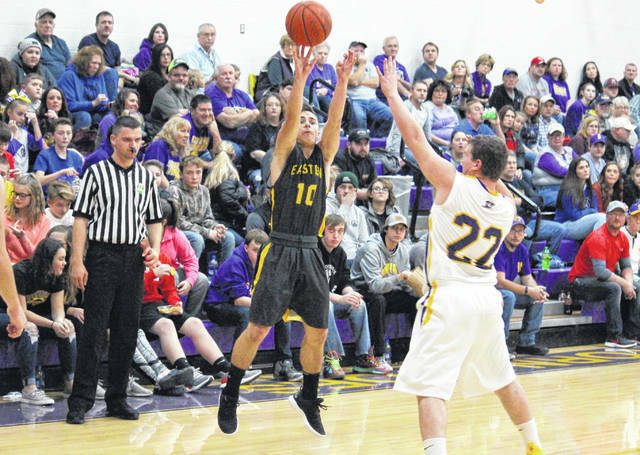 The Tornadoes (0-3, 0-1 TVC Hocking) led initially, but surrendered the next six points to the Eagles (2-1, 1-0), who stretched their advantage to as many as five points on three separate occasions in the first quarter. Southern regained the lead at 17-16 with 24 seconds left in the quarter, but Eastern made a two-pointer to end the period with an 18-17 edge. The teams exchanged the lead three times in the first 3:30 of the second quarter, and Southern held a 26-22 advantage with 4:30 left in the half. The Eagles tied the game at 26 and 29, before closing the half with an 11-to-2 run and a 40-31 lead. Eastern started the second half with a 7-to-2 run, stretching its edge to a game-best 14 points, at 47-33, with 5:49 left in the third. However, the Tornadoes ended the period with a 10-to-4 spurt, trimming the Eagle lead to 51-43 headed into the finale. SHS hit back-to-back buckets to start the fourth quarter, cutting the margin to just four points with 6:50 to play. The guests gained some breathing room with four straight points, but Southern got all-4 back and trailed 55-51 with five minutes left in regulation. The Eagles responded with an 8-2 run, stretching their advantage to double digits, at 63-53, with two minutes remaining. Southern went 1-for-6 from the free throw line in the next minute, before hitting a two-pointer to cut the EHS lead to seven. Eastern made four straight free throws and led 67-56 with 39 seconds to play, but a Tornado triple cut the margin to eight points with 22 seconds left. The Eagles sealed the 70-59 victory by making 3-of-4 free throws in the final 21 seconds. Following the rivalry victory, first-year EHS head coach David Kight felt a sense of fatherly pride in his team, and talked about how important it was to start the game on the right foot. Conversely, 11th-year Southern head coach Jeff Caldwell tipped his cap to the Eagles, and acknowledged his team’s struggles were too much to overcome. The Eagles connected on 24-of-54 (44.4 percent) field goal attempts in the win, including 6-of-14 (42.9 percent) three-point tries. The Tornadoes shot 20-of-47 (42.6 percent) from the field, including 4-of-17 (23.5 percent) from beyond the arc. At the free throw line, Eastern was 16-of-28 (57.1 percent), while Southern was 15-of-30 (50 percent). Kight noted that seeing shots go down was a welcome change from the Eagles’ 61-34 loss to Chesapeake, but that defense and rebounding were perhaps more important to the win. Eastern managed to overcome a 33-to-24 rebounding deficit on Friday, which included 11-to-9 on the offensive end. Collectively, the Eagles marked 13 assists, eight steals, one blocked shot and nine turnovers, while the Tornadoes had team totals of eight assists, three steals, one block and 15 turnovers. Caldwell was pleased with the effort his players showed to stay in the game, but noted the areas his team must improve on before becoming successful. “Right now we’re struggling with two very, very vital parts to the game, that’s free throw shooting and rebounding,” Caldwell said. “The defense obviously has to get better, I did see a lot of fight from some guys tonight, so we’ll get there. We’re getting the fight and the effort we need, but our execution isn’t very good and we’re not valuing the little things, like stepping up to the free throw line and making foul shots. EHS senior Sharp Facemyer — who tied with Isiah Fish with a team-high four assists — led all-scorers with 21 points, on a pair of three-pointers, a trio of two-pointers and nine fourth quarter free throws. Garrett Barringer scored 15 points in the win, Fish added nine, while Ryan Dill finished with eight points, including six from long range. Colton Reynolds and Blaise Facemyer each had seven points for the victors, and Mason Dishong added three, with Dishong and Blaise Facemyer trying for a team-high with six rebounds apiece. Blaise Facemyer led the EHS defense with three steals, while Fish rejected a shot. Trey McNickle led the Purple and Gold with team-highs of 18 points, 13 rebounds and five assists. Jensen Anderson hit a game-best three triples on his way to 13 points, Brayden Cunningham added a dozen markers, while Cole Steele chipped in with eight. Weston Thorla contributed five points to the SHS cause, Arrow Drummer came up with two points, while Austin Baker scored one. Thorla led the SHS defense with a pair of steals, while Steele blocked a shot. These teams are slated to meet again on Feb. 15 in Tuppers Plains. 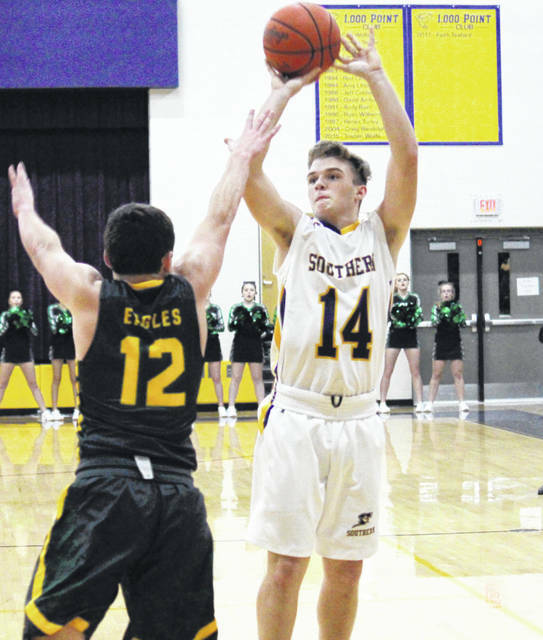 The Eagles return home to face South Gallia on Tuesday, when Southern makes its way to Federal Hocking.